Tonya Roker-Davis, MBBs, MSc, DM is a graduate of the University of the West Indies, Trinidad, West Indies. 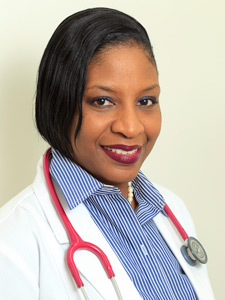 She trained in Family Medicine at the University of the West Indies School of Clinical Medicine & Research, Nassau, Bahamas where she obtained a Diploma, Master’s and Doctorate of Medicine in Family Medicine. Dr. Roker-Davis is a consultant in Family Medicine and has been practicing since 2003 at the Accident and Emergency Department, General Practice and Agape clinics, and the South Beach Health Center, (Public Hospital Authority).